Within exciting Nora Black were all the necessary ingredients for an explosion. All that was missing was the fuse, the detonator. Jay Carson supplied that lack. Nora’s brother, Robin, had it in him to be a great football player, until Jay showed him that there were other games to be played — just as physical but less dangerous. 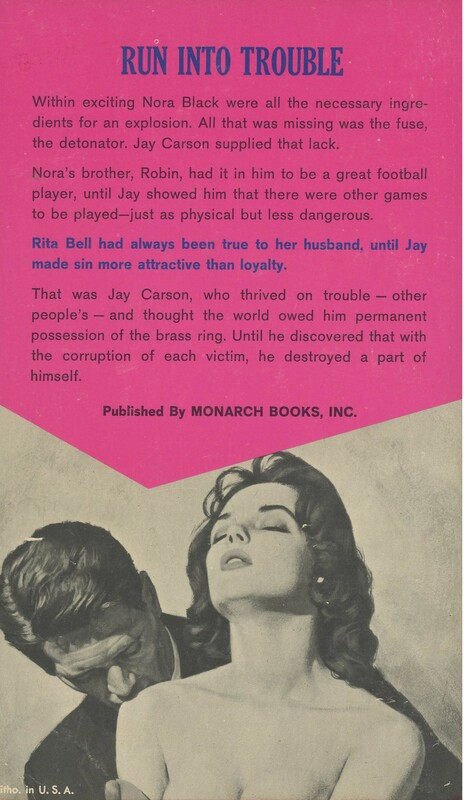 Rita Bell had always been true to her husband, until Jay made sin more attractive than loyalty. That was Jay Carson, who thrived on trouble — other people’s — and thought the world owed him permanent possession of the brass ring. Until he discovered that with the corruption of each victim, he destroyed a part of himself. I desperately want to read this book, but it won’t show up on worldcat.org. It’s like it doesn’t exist! Can you help me?